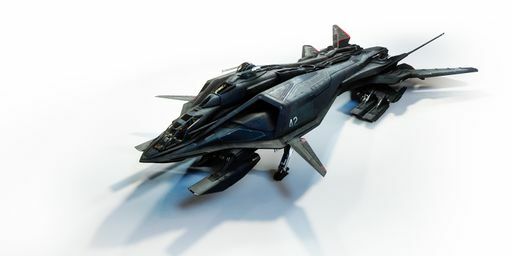 The Aegis Retaliator is a heavy bomber used by the UEE Military for centuries. 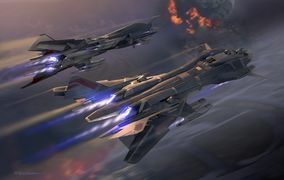 It is a key portion of the UEE’s power projection, Retaliator squadrons have served with distinction against outlaws, the Vanduul and elsewhere. 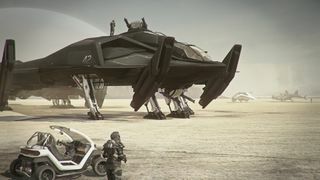 The base version of the Retaliator is customizable with additional modules. 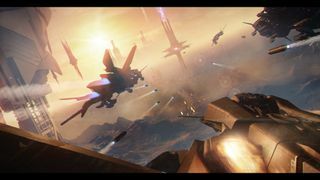 The Retaliator was first introduced as a heavy UEE bomber. Later the option came to swap out various modules and bays to convert the heavy bomber to something else entirely. Next to nothing is known about the bomb bay, other than that it is located at the underbody front bay of the ship . 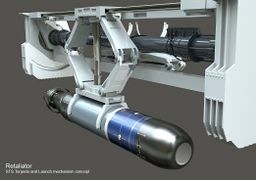 Though, it is to be noticed that a Bomb Bay should be coming in the future as it makes perfect sense for a bomber to have one , a specific module called "bomb bay" had not been announced yet, all the references to "bomb bay" actually mean "torpedo bay" as in the early stages of the game, bomb and torpedoes were confused and no clear difference had been made between those. 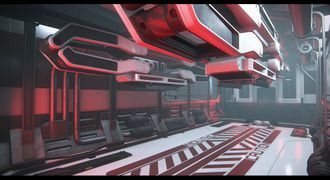 A module to turn the Retaliator into a hangar. 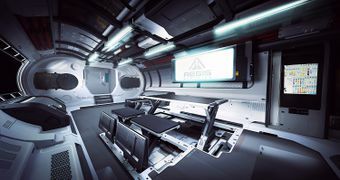 Standard equipment includes a retractable dining table, holo-screen, personal storage area and drink machine (front) or a sink, personal storage area, two couches, retractable table and holo-screen (rear). All the equipment can be personalized. 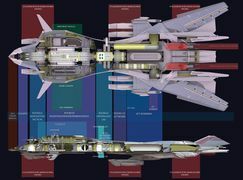 Replaces the bomb bays with cargo, the front and rear can each hold another 20 Standard Cargo Units of freight and have an independent lift platform. The lift can be raised/lowered from either the station on the platform or from the ship’s interior. 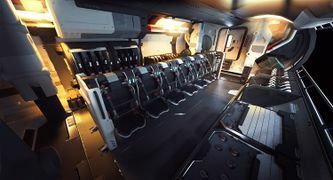 The Retaliator’s dropship module has seats for twelve troopers complete with safety harnesses and two heavy weapon racks in the middle of the lift. 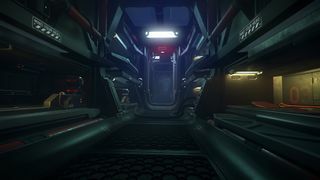 The outer ring of the bay serves as an armory, including two grenade/ammunition cases, four rifle racks, two sidearm racks and energy recharge stations for all standard power armor. 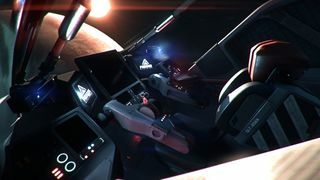 Standard equipment for most UEE military Retaliators, the ship was designed to mount two torpedo bays. The forward bay carries four torpedoes while the rear bay adds two more. 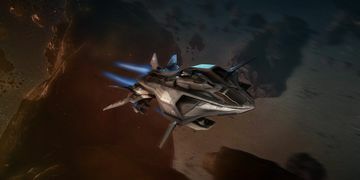 Since its introduction in the 26th century, Aegis Dynamics’ Retaliator has had a distinguished, if conflicted, history. Before they started designing the bomber, researchers performed extensive interviews with military pilots to understand what was lacking in the contemporary bombers of the time. This pilot-centric approach drove the design decisions of what became the Retaliator; a heavy ordnance weapons platform capable of handling both fighters and ground targets. 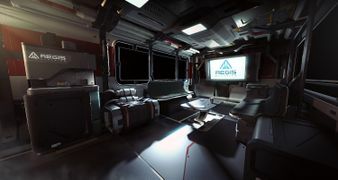 Although the Retaliator was almost synonymous with the reign of Messers and began to see decreased usage as the military distanced itself from that era, the ship began a surprising resurgence in the private sector. 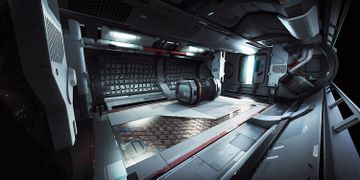 Retaliator Base: The Retaliator Base is the base loadout of the Retaliator. 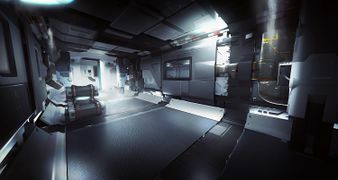 It is an "empty" ship without any modules installed, allowing the pilot to purchase and install modules to customise their design. Even without install-able modules, the Retaliator is still a formidable fighter with its array of manned turrets. 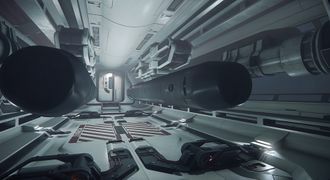 Retaliator Bomber: The Retaliator Bomber is equipped with two torpedo bays, stocking six high-yield Size 9 cluster torpedoes for large targets. Covered by its turrets and strong defenses, the Retaliator bomber is a dangerous threat to capital ships and installations alike. 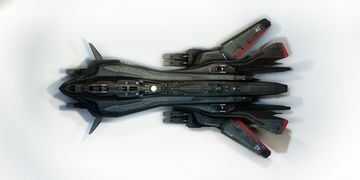 For a full gallery, see :Category:Retaliator Images. ↑ Bombs on the retaliator ?